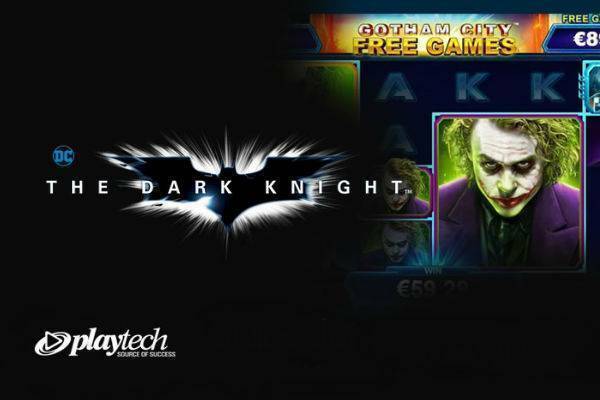 The Dark Knight is a new progressive jackpot game from Playtech. It’s based on the Batman movie itself, with the Joker, Two Face, Bruce Wayne, and well, Batman, featured prominently. Just to be clear, this is a completely different game from Microgaming’s slot with the same title, and is part of Playtech’s DC Super Heroes Jackpot series. This slot is a 6 reel 50 payline game, with bonus features and contains a total 4 progressive jackpots that can be won. You can give The Dark Knight a spin at one of these tried and tested online casinos. It’s really easy to get started with the Dark Knight. On the bottom of the screen, you will find a menu that says Total Bet. Adjust it with the Plus and Minus buttons to suit your liking. All 50 paylines are always active, so that’s it. Minimum bet per spin starts at £0.20, which is not all bad for 50 lines on a progressive game, and for high rollers, bet size goes all the way up to £15 a spin. Once bet size is set, you’re ready to press the Spin button, which is the yellow button with the Batman logo to the bottom right of the screen. To fine tune things, there’s an Autoplay feature, as well as a Turbo feature that will make the reels spin faster. Batman is awesome, but the £1 million jackpot is awesome-r. 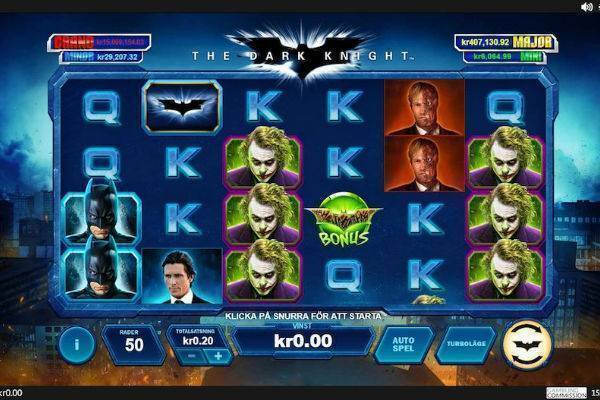 So without further ado, here’s how you win the Dark Knight jackpot. It’s surprisingly simple. Unlike other jackpot games, any spin, regardless of bet size has a fair chance at hitting the jackpot. You don’t even need to have any special symbols on a payline. The jackpot happens completely randomly and you will be moved to a new game screen, where you’re guaranteed to win one of the 4 jackpots: Mini, Minor, Major, and Grand. The Grand jackpot is worth at least £1 mil, while the others are smaller. When you’re in the jackpot game, you’ll see a hive of 20 icons. Click on them to reveal their colour, which corresponds to the jackpot. (Grand is red, just so you know.) Once you’ve filled in an area, the jackpot is yours. Batman Respins: This is when you get Batman stacked on the 1st reel. All Batman and Batman logo symbols will stay in place while a coin is tossed. If the coin lands blue, you get a re-spin, and if it lands red, you collect your payout and return to the base game. The feature can be re-triggered with new Batman and Batman logo symbols added to those already locked in place. Joker Respins: Get Joker stacked on the 6th reel and you activate this feature. Very similar to the Batman Respins, except it’s Joker and Batman logo that are locked, and it’s the red side of the coin that will get you the re-spin, instead of the blue. The Dark Knight Free Games: When you get the Batman Bonus symbol on the 2nd and 3rd reel, you’ll trigger a round of 7 free games. Batman also becomes a Wild here, and the Batman logo pays like the higher value Batman symbol. Agent of Chaos Free Games: Get the Joker Bonus symbol on the 4th and 5th reel, and you’ll trigger 7 free games. What’s super cool is that you’ll get extra-large Joker symbols to help you make more wins. We’ve seen it cover up to 6 places! Gotham City Free Games: When you get Batman Bonus on 2nd and 3rd reels, plus Joker Bonus on 4th and 5th reels, you’re in for a wild ride of 7 free games. It combines the extra features of the Dark Knight and Agent of Chaos free games, so that Batman is always a Wild, while you have these huge Joker symbols falling down the reels. If Joker overlaps with a Batman symbol, then it’ll become one massive wild. That means big wins ahead! For the Dark Knight, Playtech has worked with DC Comics to deliver the authentic characters from the movie. It’s slick and especially electrifying when you hit the Gotham City Free Games. We have to admit that we do find Microgaming’s version just a touch sexier in that cold, dark, mysterious way, but Playtech has definitely done more than a decent job to do justice to one of the most popular comic and movie series. Playtech is pretty famous for its progressive jackpot series. With The Dark Knight, you can know have a chance at winning a cool million at just £0.20 a spin with some of the most popular DC Comic characters. Even if you don’t become a millionaire overnight, this slot has a RTP of 95.96% coupled with a ton of bonus features to make it a rewarding and fun game to play. Get into Gotham City at one of these top online casinos.